Take a look at the published books in our collection classified under the subject Vegetarian Diet and you might be surprised. A substantial number were published in the second half of the 19th century. The first vegetarian society in the modern Western world was established in Britain in 1847. By 1899 the Society had nearly 6000 members and associates and was a small but influential movement. Wellcome Library books catalogued for vegetarian diet by publication date. The biggest spike is for 16 books published in 1920, mainly by the Vegetarian Society. Many Victorian vegetarians were also active social reformers in other movements such as the temperance , anti-war and non-violence campaigns, and radical Christianity. 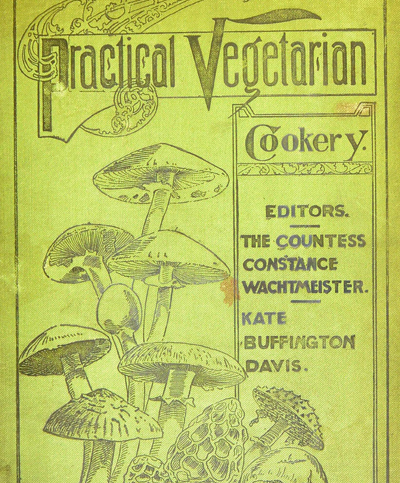 Martha Brotherton’s Vegetable Cookery was one of the earliest vegetarian cookbooks. 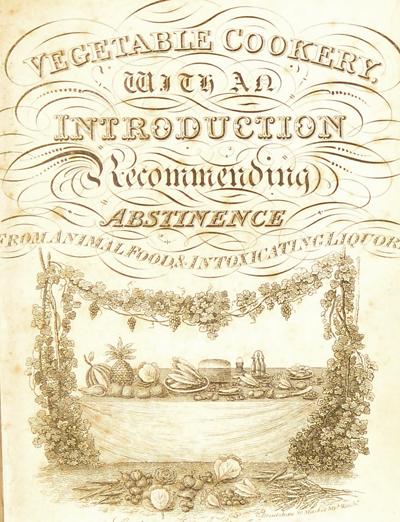 The introduction recommends “abstinence from animal foods and intoxicating liquors” and declares that “a vegetable diet is more favourable to health, humanity and religion”. 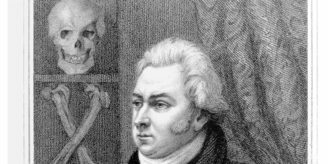 Her husband, Joseph Brotherton was a founding member of the Vegetarian Society and a non-conformist minister and Member of Parliament for Salford, who campaigned against the death penalty and slavery. Title page of Vegetable Cookery by a Lady, 1833. Vegetarianism in the late 19th century was a progressive movement in more ways than one; campaigners made full use of the science of the day to advance their cause. In his book, the Vegetarian Armed at All Points, William Horsell gives a detailed account of the aims of the Vegetarian Society. He includes chapters on comparative anatomy, analytical chemistry, human physiology, domestic and political economy and moral elevation. The Penny Vegetarian, a promotional booklet written by Dr Nichols and published by his company was also aimed at this market. Nichols was one of several vegetarians who developed ‘healthy’ foods and meat substitutes for the vegetarian market. Thomas Allinson (of wholemeal bread fame) was a fellow vegetarian and Adventist. Concerns about food adulteration also contributed to the interest in vegetarian diet amongst the urban middle classes. “It is surely much safer to live on such pure and healthy foods as fruit, grain, pulses and vegetables, than to run the risk of eating the bodies of diseased animals” Nichols declared. 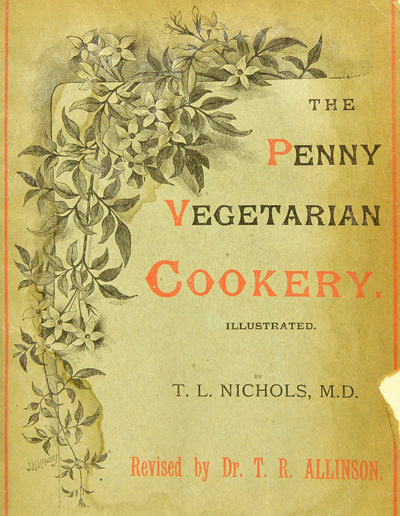 Cover of the Penny Vegetarian Cookery by T. L. Nichols, 1891. The vegetarian diet was often advocated by other unorthodox practices such as hydropathy and – at the end of the century, theosophy. Perhaps reflecting a wider concern about lifestyle and self improvement amongst a growing, educated urban population. Some books gave the impression that taste didn’t matter as much as the cause. 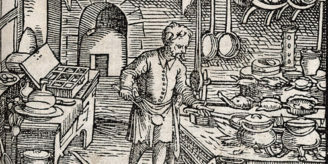 Something that Mrs Bowdich observed in the preface to New Vegetarian Dishes: “it is not the chemical ingredients, which determine the diet, but the flavour; and it is quite remarkable, when some tasty vegetarian dishes are on the table, how soon the percentages of nitrogen are forgotten”. Her recipes also show that Victorian vegetarians were not averse to making the most of modern food processing techniques (such as tinned food) and more adventurous ingredients such as curries (largely made by adding curry powder) and lentils. 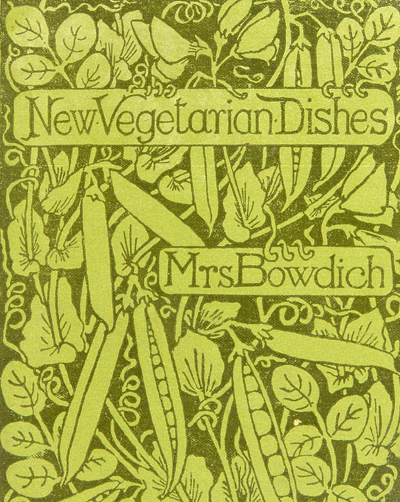 Cover of New Vegetarian Dishes, 1893. By the end of the century, the author of Practical Vegetarian Recipes was able to claim that his recipes were “as used in the principle vegetarian restaurants in London and the Provinces”. In 1897 there were 32 vegetarian restaurants in London, many in prominent locations such as Oxford Street and Charing Cross. The membership of the Vegetarian Society would not have sustained all of them, so who went to these restaurants? Colin Spencer suggests that it was the “new educated lower middle classes” with limited budgets and broader horizons who frequented vegetarian restaurants. The menu from Practical Vegetarian Recipes contains some dishes that are now ‘classics’ of vegetarian cuisine, for example lentil cutlets and stuffed mushrooms. Others, such as mock eggs as a dessert are more curious. 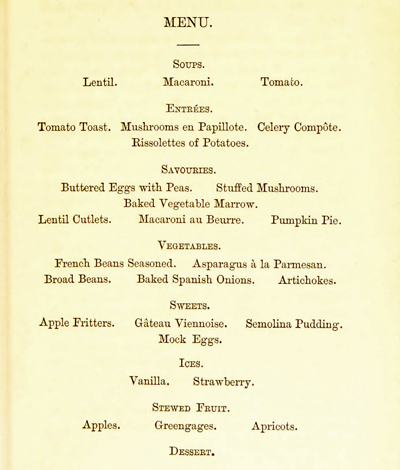 Menu from Practical Vegetarian Recipes by Charles Forward, 1891. By the end of the century, even the new and revised edition of Mrs Beeton’s Book of Household Management contained a chapter of vegetarian recipes, noting that “With the now strong movement in favour of the vegetarian diet, it is hoped that many will try how pleasantly some of these dishes will relieve “the eternal beef and mutton” of homely tables and how well they are adapted to the diets of children and delicate persons”. Along with a wider acceptance of the vegetarian diet, it seems that Victorian society swallowed some of the social ideology implied by vegetarianism, namely frugality and good health. Mrs Beeton helpfully provided vegetarian dinner menus for each month of the year. Here are the suggestions for May. Bon apetit! Gregory, J. Of Victorians and Vegetarians, 2007. London: Tauris Academic Studies. Spencer, C. Vegetarianism: a history, 2000. London: Grubb Street. Lalita Kaplish is Web Editor at the Wellcome Library. You can also find her on LinkedIn and Twitter @LalitaKaplish.